This page is displayed upon successful log in. 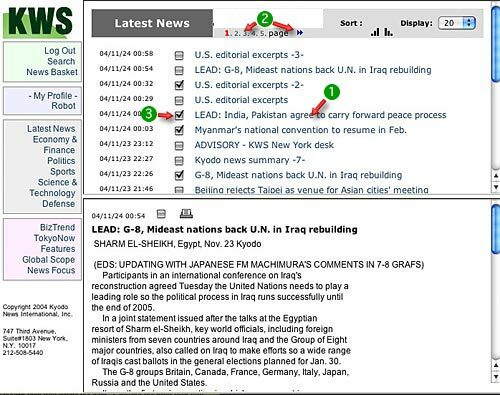 Headlines of stories filed during the previous 48 hours are displayed with the most recent appearing first. Clicking on a headline will display the full text of the story. Clicking on the page numbers or arrows at the top will cycle the pages accordingly. 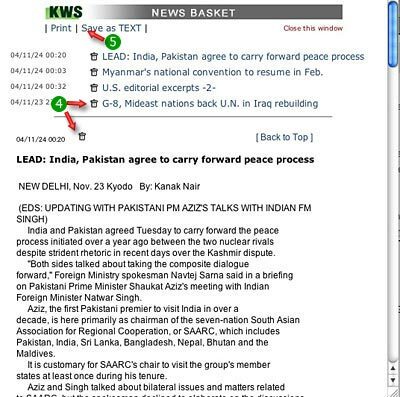 Clicking on the box to the left of each headline will put the selected story in your News Basket. This will be confirmed by a window showing headlines of the items you have selected on the left of your screen. Closing or minimizing the News Basket window will let you continue adding stories. KWS Special Reports include features and summaries of recent happenings over and above the day's datelined stories. 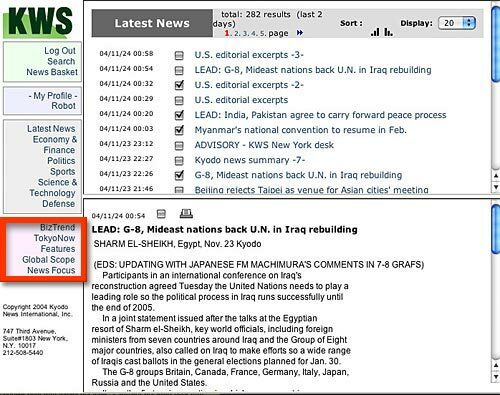 News Focus - Bylines features and analysis of topics in the news with an emphasis on Asia. Features - Stories about people both in and out of Japan. News Basket saves stories you select for later review. Clicking on any headline displays the full text. Clicking the trashcan icon will delete the item. Clicking the print icon will send the story to your printer. Clicking "print or Save as .txt" will perform the indicated function. *Please note that items saved in your News Basket will be lost when you log off. 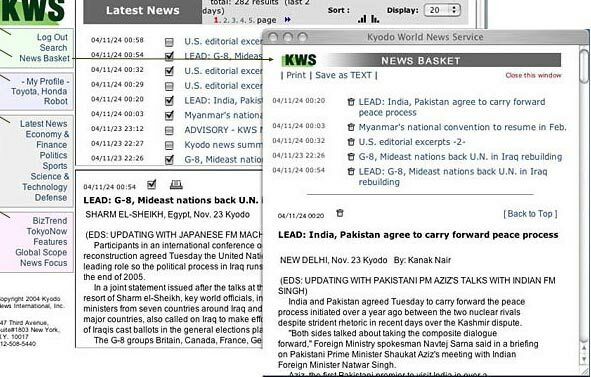 Filling on one or more of the boxes in Create Profile will create a custom news profile which you can use every time you sign on to Kyodo World Service. You can use either key words or phrases you choose or select from one of the "Category" profiles we've already created. Once you're finished give your profile a name in the box at the bottom and click Create Profile. You'll see this name on the left every time you sign on. Several profiles can be kept this way. To access them, just click on the name. 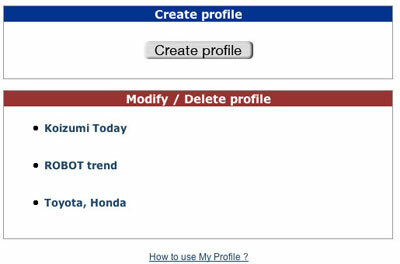 If you want to modify a profile, click on its name and make the desired changes in the Edit Profile window. To delete a profile, open it and then click Delete at the bottom of the frame. 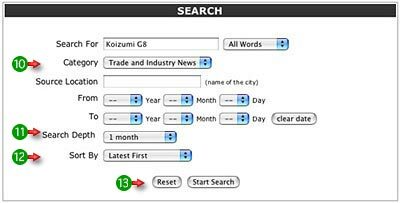 Typing a single word or name beside Keyword will find all stories containing that word or name. Typing a phrase of two or more words within quotation marks will treat the phrase as a single text item and search accordingly. Typing several words separated by commas will find stories containing any or all of the words. Entering a word followed by a plus sign and a second word (Toyota+USA) will find only stories where both words appear somewhere in the story. Entering a word followed by a minus sign and a second word (Toyota-USA) will find stories that include Toyota but not USA. 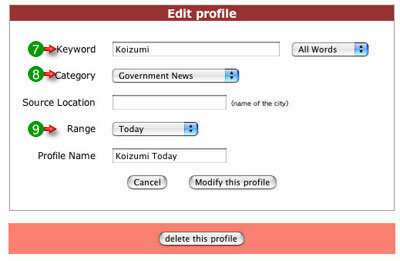 Category lets you utilize several broad profiles pre-selected by Kyodo News. "Date Range" lets you set a time limit to your search. Since several years of text are available, limiting your profile to just a few days or weeks will speed up the time it takes to show up on your screen. The Search function lets you find stories about specific topics. The default lookback period is one month. Clicking on one of the news categories to the left will limit your search to only stories in that category. Since the available file extends back seven years you will find it useful to use the "From/ To" function to bracket the time period you're interested in. The Search Depth function lets you decide how far back you want to look. The order of stories can be changed between 'Latest First' and 'Oldest First'. "Reset" clears all fields and lets you start again.